Welcome to a very special 25th issue of UWW Ted Tips! This special blog post takes the form of a video blog or VLOG! You’ll find a video recording below with an outline of notes. The main purpose of the TED Tips blog this week is to provide some ideas of how to build a digital “lesson” and to show you some ideas how to do that inside of Canvas! The main idea is to create a written outline or “to do” list associated with that idea. It is always a good idea to provide communications to students for a completed lesson — in this case, I’ve shown an announcement in Canvas for that page. Inside of Canvas, you’ll want to create a page or a module as a “wrapper” to contain the content. It’s a good idea to include a purpose or objectives — what’s the key idea or essential learnings for the digital content. Issue 25 was structured in a way to provide an example of what this could look like and will set the tone and idea to explore these in different ways! 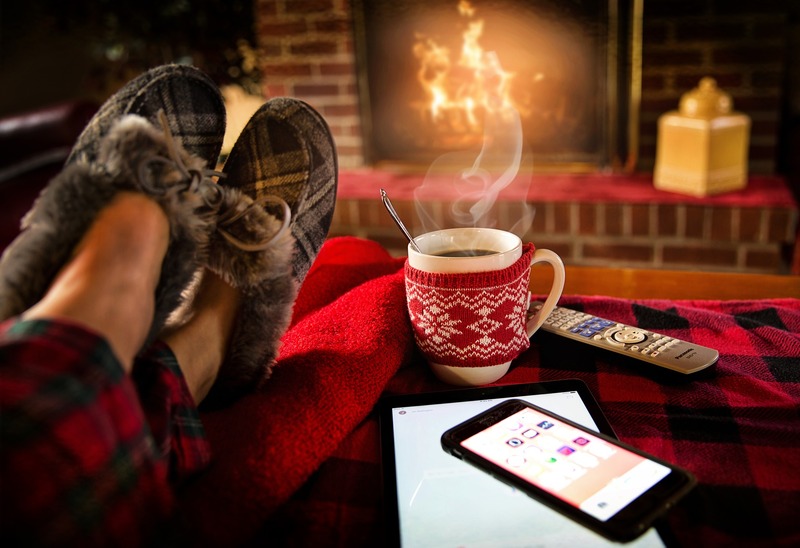 TED Tips – Issue 24: Winter Break! As the 2018 Fall Semester concludes, I want to reflect on the first six months of writing this blog. It has been a great honor to share discoveries, explore new ideas, and write about topics related to Technology, Education, and Design. I hope that these TED tips continue to inform and inspire as we celebrate teaching and learning at the University of Wisconsin Whitewater. 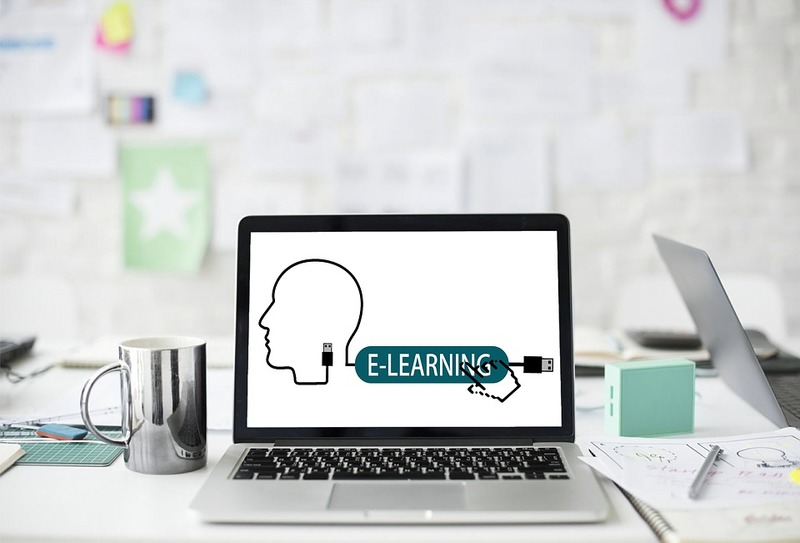 Over the last six months, we have explored the difference is between a Learning Management System (LMS) and a Digital Learning Environment (DLE). This distinction is important as it helps to lay the foundation for some of the key decisions applicable to the migration from D2L to Canvas at Whitewater and throughout the UW System. Canvas has been a source for several posts. The LTC Canvas peer mentors shared some of most important lessons learned while working with Canvas in the classroom. We looked at ways to support communications in Canvas and the importance of making a good first impressions. We explored grading and using Speed Grader in Canvas. What are some different ways technology can be used in the classroom to support your teaching learning? Tools like Poll Everywhere can increase student engagement and interaction. “23 Things for Digital Knowledge” provided activities that can build student fluency in digital literacy. TED Tips have explored the 2018 NMC Horizon Report and its view the trends, challenges, and developments in educational technology as it impacts higher education. Using the Horizon Report provides a lens to highlight pilots and innovative work taking place on campus like Adaptive Learning. The next session in the 2018-19 UW-Whitewater LEARN Center/Learning Technology Center Workshop Series: “Back to Basics to Balance Workload” is Thursday, January 10th from 10:00am to 2:00pm in the University Center. This four hour workshop includes lunch and is designed as a hands-on activity to help prepare for your spring classes! Session Four: Setting the tone early saves time in the long run: Crafting your syllabus and engaging students before the first day of class and beyond. During the morning session of the workshop, presenters will share evidence-based strategies for creating a more learner-centered syllabus and share tips for engaging students from the first day (and even before class begins!). After a lunch discussion, participants will learn more on how to better utilize Canvas in their courses in a way that clarifies organization and sets expectations in a more transparent manner. Participants will end the session with time to revise their syllabi, first day activities, and/or Canvas course pages and share their materials for small group feedback. Thank you for taking the time to read these posts! TED Tips will return in 2019. Topics next year will build on and support some of the upcoming workshops with TED Tips planned to explore several types of rubrics, building them in Canvas, design of a course homepage, navigation, analytics, and many others. I hope to experiment a bit more in format and content and hope to record the occasional complementary podcast! Until then, have a great holiday break, recharge, and relax! See you next year! Podcasts have recently seen a dramatic increase popularity. Podcasts are audio shows, often produced on a particular theme or topic, and hosted online. These audio files can be extremely valuable resources. Several have archives of hundreds of episodes. Many come with corresponding “vodcasts” (video files) as audio supplements to other media. They can provide a great supplement to class, replacement for a lecture, or additional resources for students. Because they are easy to create and accessible, a podcast assignment could replace a written paper or report. They are portable audio files; perfect for a commute, time at the gym, or other activities. Many previous radio shows and (more recently) TV shows have been repackaged and rebranded with corresponding podcasts. 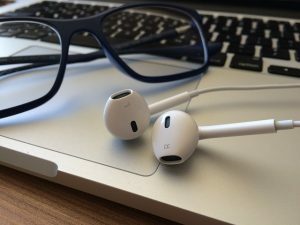 Most podcasts have free webpages (many embedded from this post) that allow you to navigate to the webpage, find the link and site you are looking for, and press play. These are also great because it can be easy to link from a classroom page to an online resource. Several of the prominent sites include guides on how to incorporate them into your own classes. Various podcasting apps or “podcatchers” can help enhance that experience. These let you to download to a mobile device (for offline listening), update when recent episodes come out, and allow you to search and browse by topic to help find the shows you are interested in. I recommend trying one, customizing the settings to meet your particular needs, and experimenting with different shows. What follows are some of the most common applications and services (there are many others). This should not be seen as an endorsement of any particular service but a list to help get you started. There are several types of apps, services, and many contain upgradable premium functions. Apple Podcasts (built into your iPhone). What are some good podcasts? Teaching in Higher Ed Podcast. “This is the space where we explore the art and science of being more effective at facilitating learning. We also share ways to increase our personal productivity, so we can have more peace in our lives and be even more present for our students.” The podcast focuses on topics such as digital pedagogy, creativity in teaching, educational technology, and many others. Create a 3-5 minute unit or module overview! This audio file could be included with your material each week and help focus students on the weekly objectives, what to do, and any specific tips to be successful with key concepts and homework for the week. Replace a written paper with a podcast assignment. Have students record a short 60 – 90 second audio report. Have student research podcasts about specific topics. While not a substitute for formal research, it helps identify additional resources and allows students the opportunity to evaluate appropriateness for a course. Back in Issue 10 “Tips and FAQ’s from a Peer Mentor” at the start of the semester, we introduced the LTC faculty peer mentors that are available for each college to assist with the Canvas Transition. Canvas 24/7/365 is still the place to go for Canvas questions, but the peer mentors can help by sharing what they have discovered and learned. The peer mentors gather monthly to share notes and discuss what we’ve learned. Now that we are approaching the end of the semester, I want to share some of the lessons learned this term in Canvas from our most recent Peer Mentor meeting. These are all Tips shared by the mentors on things they learned this semester while using Canvas. Hopefully they can help you! Provide a bit of navigation and orientation to the class at the beginning of term. Show students where important things are located in Canvas. Review with them where they need to go and what they need to do. While Canvas is mostly new to us as faculty, it is also mostly new to students. Even thing like how to submit an assignment in Canvas can be really helpful. 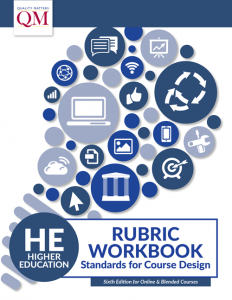 Providing that guide to where things are in your course can be really helpful to students. Setting up the Course Home page in Canvas is important. Organizing content by weeks or by topic helps a lot. Don’t underestimate the important of structure. Students have the tendency to click on the assignment tab – and they miss the rest of the weekly content, the readings, and other supporting activities. It is important to link back to those weekly modules from the assignments…and remind students to check the content in each module each week. Creating a weekly checklist or “TO DO” list is very helpful to students. D2L could create those as you were creating content, Canvas does not do that. I create a checklist item for students and post it at the top of each module as a roadmap for the week. I can also physically hand out a notecard with that weekly checklist to students in class so they know where to go and what to do. Creating larger assignments with multiple parts is easier to set up in Canvas as a series of different assignment submissions. It is also easy to create these as multiple “zero” point assignments. So, for example, if a student needs to submit a rough draft as a paper, create a separate assignment for that rough draft – you can then use speed grader, provide feedback, and return it to students. The FINAL paper or submission can be created as a separate assignment in Canvas. Setting up the gradebook to reflect more logical areas that corresponded with assignments makes providing feedback and grading much easier. Help answer your transition questions. Provide you with training information and resources about the Canvas platform. Work with you to understand different ways that Canvas can be leveraged for enriching teaching and learning. 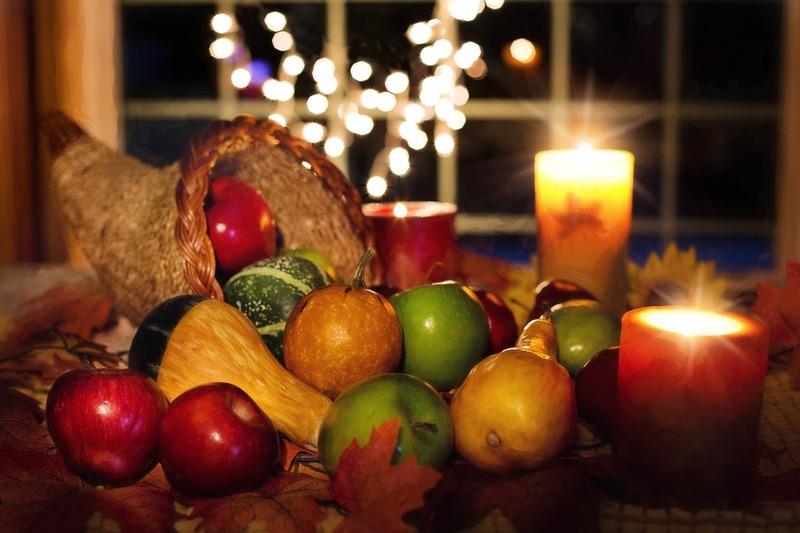 TED Tips – Issue 21: Happy Thanksgiving! An abbreviated TED Tip this week: I want to take the opportunity on behalf of the Learning and Technology Center to give thanks! Happy Thanksgiving! I am thankful for the opportunity each week to write these blog posts and explore some of the ideas and themes about which I am passionate. It has been an honor to explore the themes of Technology, Education, and Design (TED). I continue to examine our technological environment and learn more about the tools available to us. What can they do? How do we use them well to enhance our teaching and learning? What types of things help us to make a difference in our students’ lives? What contributes toward student success? How do we design experiences that support our students in this way? Please feel free to drop by Learning Technology Center on the Whitewater Campus, leave a comment here, or send me an email! I plan on continuing to provide tips each week on these themes and am thankful to have a platform to do so! There are a number of planned tips over the next few weeks. Topics include: how to design successful layouts and content, how to build rubrics in Canvas, and an exploration of additional tools and services. There are more stories to tell and things to be thankful. The next Workshop in the 2018-19 UW-Whitewater LEARN Center/Learning Technology Center Workshop Series “Back to Basics to Balance Workload” is this coming Tuesday, November 27 from 12:30 – 1:45 in the University Center room 259A. This workshop is specifically focused on “Using Groups to Engage Students and Maximize Instructor Time: A Conversation about How to Use Team Projects in the Classroom.” Eric Loepp from Political Science and Michele Peets in Management will discuss how and why they use group work, what benefits you can gain from using group activities, what strategies work, and practical tips to help you save yourself time. I’ve been asked several times where the inspiration for TED Tips originates, so this week I want to explore that source of inspiration. TED Tips talks TED talks. As such, what are TED Talks? I have named this blog TED Tips for similar reasons. I cannot resist a good pun and acronym – so basing the blog name off of my name “Ted” made sense in the context of my job in the Learning Technology Center as a Teaching, Learning, and Technology Consultant. My job title can apply directly to the use of TED as “technology, education, and design” as it applies to higher education. Finally, I find affinity with the mission of the original TED Talks, exploring all ideas and sharing those ideas with others. I hope that this blog lives up to those standards and source of inspiration. I want to share a couple of my personal favorite TED talks and some of the ideas worth sharing. I recently discovered the following talk on the TED Radio Hour. NPR produces a radio version of the show and the accompanying podcast works wonders during my commute. Podcasts and radio broadcasts keep me thinking and engaged while I can focus driving. Recently, I was visiting with my goddaughter – a spunky, somewhat awkward, still discovering herself twelve year old. She likes cooking, acting, polar bears, and obsessed with the band BTS. Like many pre-teens, she struggles with confidence and overcoming perceived obstacles, social barriers, and school drama. A version of Megan Washington’s talk entitled: “Why I live in mortal dread of public speaking” played on the TED Radio Hour. I immediately connected some of the themes and strategies outlined in the talk to the struggles of my goddaughter. The synopsis of her talk reads and I’ll share the embedded link. Finally, I want to share one final TED Tip: There’s a TED app that builds personalized recommendations based on your preferences delivered directly to you. I’d encourage you to check it out and explore more ideas worth sharing. As I mentioned last week, I was recently at the annual Quality Matters Connect conference in St. Louis. Quality Matters is an inter-institutional peer review process dedicated to the continuous improvement of online and blended course design. This week TED Tips explores Quality Matters (QM). I serve as a Quality Matter Coordinator for the University of Wisconsin Whitewater. I am an official liaison between UWW and Quality Matters and am a go-to person for anything related to it. Please contact me if you have questions! 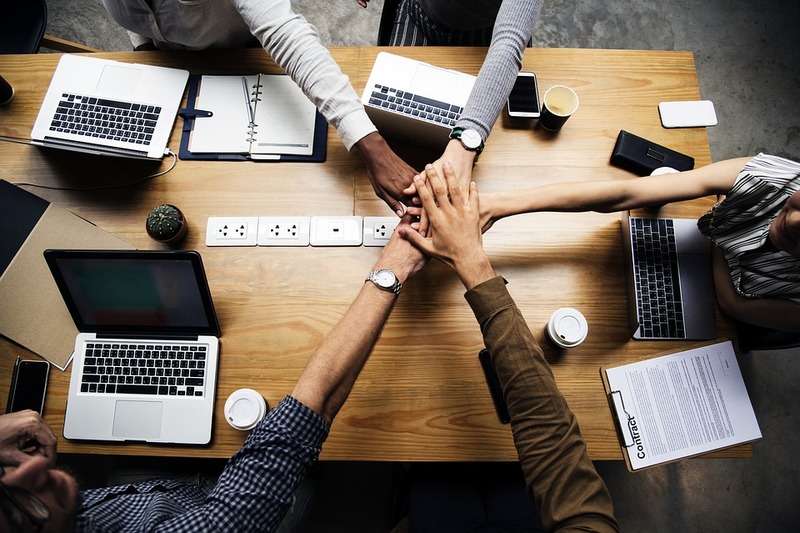 Quality Matters (QM) is a faculty-centered, peer review process designed to certify the quality of online courses and online components through a continuous improvement process. QM promotes and improves the quality of online education and student learning. It does so through the use of current, research-supported, and practice-based quality standards and appropriate evaluation tools and procedures. It supports professional development in the use of rubrics, tools and practices to improve the quality of online education. A QM-Certified Course is an online or blended course that has met QM Standards for a QM Rubric in an Official Course Review. Quality Matters is supported by the non-profit MarylandOnline. 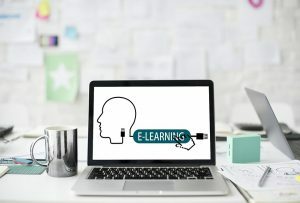 The QM Certification Mark is more than an achievement for online course design — it is evidence of an interconnected, continual process provisioned with tools, support and professional development that helps you develop and provide successful experiences to your learners. Continuous: The Quality Matters process is iterative and committed to continuous quality improvement. Given review, revisions, and support, all reviewed courses will eventual meet expectations. Centered. Quality Matters is supported by national standards of best practice, research literature, and instructional design principles. Collegial. The process is faculty driven; peer reviews are diagnostic and collegial, not evaluative nor judgmental. Collaborative. Reviews are flexible and offer constructive feedback. They are not prescriptive. The three main elements of Quality Matters are the QM Rubric, the peer review process, and professional development. It is important to emphasize that Quality Matters addresses only the course design of online classes. Quality Matters does not address the delivery (how instructors actually teach courses). Quality Matters does not address other factors that may impact the quality of online courses such as faculty or learner readiness, and our digital learning environment. Many of these other factors are themes we explore each week in this TED Tips Blog. The Learning Technology Center offers additional faculty development opportunities to learn about Canvas or methods to improve your online and blended teaching effectiveness through programs like the upcoming Winterim Online / Blended Teaching Institute. Quality Matters addresses one aspect of online course quality – course design. 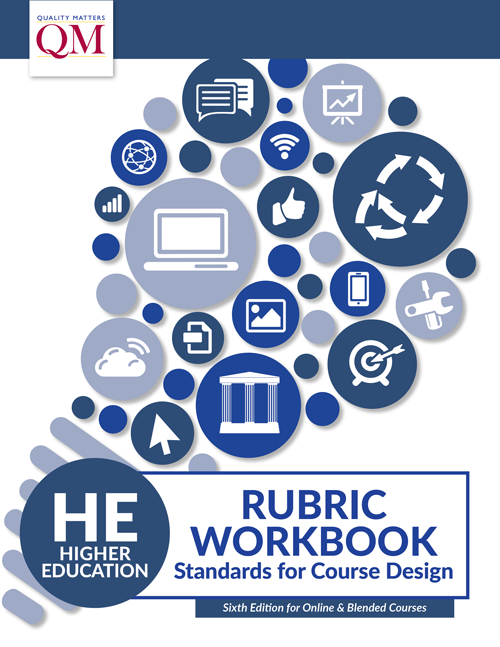 The most recent QM Higher Education Rubric, Sixth Edition, released July 2, 2018. The Quality Matters Rubric is designed to provide a rigorous set of Specific Review Standards that can be applied to online courses as part of a commitment to continuous quality improvement . While the emphasis is on online or blended courses, many of the design principles could also apply to traditional face-to-face courses. QM courses use a faculty driven peer review process. There are several options for reviewing a course ranging from formal official course review following QM processes and protocols, an internal review, or more customized consultations. Internal reviews can guide and improve existing courses. Quality matters standards can be introduced to help scaffold the development of new online classes. The review process is faculty driven and starts with a self-reported worksheet that lists basic information about the course that is useful to the review team, such as the delivery format, instructional materials, and supplemental materials that may require review. 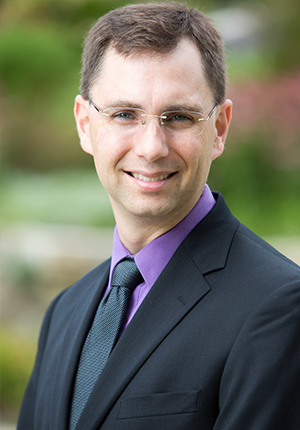 A formal peer review team is comprised of three faculty members includes a course representative. Each team includes a master reviewer that manages the process to ensure consistency and rigor; a Subject Matter Expert to advise the team about disciple-related materials and practices, and an External Reviewer outside our school to assist in providing helpful recommendations. The recommendations are constructive, specific, sensitive, and balanced to the course being reviewed. There is opportunity for revision to the course based on that feedback. Only official QM-Managed reviews can lead towards official QM Certification. If you are interested in learning more about Quality Matters in Online Learning, exploring additional professional development opportunities, or would like to discuss other factors of the design and delivery of online courses please contact me at wittt@uww.edu. Last week, I attended the Quality Matters Connect Conference in St. Louis, Missouri last week and was not able to pull together my normal weekly TED Tip. I had intended to write about Quality Matters and how the QM framework can be used to help guide and design quality courses…but conferences can provide you with so much information that it is easy to get lost or distracted in that information. And so I was. Instead, I wanted to share a few recommendations, and a blog that I discovered at the conference. I am often looking for new and interesting books and articles to read, blogs to peruse, and podcasts to fill my commuting time. Attending the conference provided me with some interesting ideas to explore! 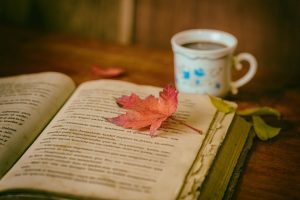 Four Books and a Blog: What follows are titles and authors from a handful of books that were recommended from within the context of various other presentations. A couple of them are newly published. For full disclosure, I have no connections or interests to any of the authors or publishers. All came up either directly in the presentations or in conversations at the conference. Each struck me as interesting and connected to Technology, Education, or Design … and could be springboards for further conversations and explorations. Dr. Milliron was the keynote speaker at the annual Quality Matters Connect Conference. Ge serves as the Co-Founder and Chief Learning Officer of Civitas Learning. “Civitas Learning Space is a digital community designed to engage education leaders as they explore key trends, issues, challenges and solutions in the use of analytics to improve student success.” The blog is a collection of thoughts, research, and stories that are intended to help faculty inform their practice. One of the key themes was the predictive analytics movement in higher education. High-Impact Practices in Online Education: Research and Best Practices by Kathryn Linder (Editor). This volume offers the first comprehensive guide to how high-impact practices (HIPs) are being implemented in online environments and how they can be adjusted to meet the needs of online learners. I am always interested in what people are reading and some of the latest books and research for trends in technology, education, and design. If you have a recommendation or suggest for me, please feel free to contact me at wittt@uww.edu. This week, I conclude the three part series exploring the New Media Consortium’s Horizon Report. The report “identifies and describes the higher education trends, challenges, and developments in educational technology likely to have an impact on learning, teaching, and creative inquiry.” This week focuses on developments in educational technology. These developments were chosen because they are likely to drive technology planning and decision making and are organized in time intervals related to their approximate time of wide spread adoption. The report identifies seven broad categories of technologies, tools, and strategies. The categories help us understand where we are today. The developments look ahead where we may be going in the future. Consumer technology are tools originally created for recreational or consumer use. As the technologies become more utilized, they have been used as learning aids. Examples include: drones and wearable technologies like fitness trackers. The move from physical textbook to shorter videos highlights this “consumer demand” driving change in the classroom. Digital strategies enrich teaching and learning by repurposing older activities for the modern digital classroom. They often reinvent conventional ideas to create meaningful 21st century experiences. The transformation of a pager to a cell phone to a smartphone exemplifies this march towards digitalization. Other examples include: The use of location intelligence (GPS), digital makerspaces, and applying concepts of gamification to the classroom. Enabling technologies transform what we expect of our devices. The classic example is the voice activated computer as depicted in Star Trek; but more commonly realized through Alexa, Siri, and the Google Assistant. Those enabling technologies allow us to do more things. The trend towards cord-cutting is another example. Internet technologies represent the underlying digital infrastructure. Internet technologies allow us to interact seamlessly and connect more devices in more ways. The “Internet of Things” is an example of how more components in the wired world are being connected to the internet. Another way to think about this is the idea that the Internet is a “utility” — along with the corresponding Digital Divide that highlight inequalities in the infrastructure. Learning technologies are resources specifically developed for education. They help make learning accessible and available to all. Our digital learning environment is an example. Learning environments are increasingly customizable and personalized. Online courses and the related mobile learning platforms expand the access of education. Adaptive learning is another example of a learning technology. Larger systems like Lynda.com have been developed that offer training and learning at our fingertips. Fully online programs have redefined higher education possibilities…and created new opportunities. The rise of social media technologies have changed communication and interpersonal relationships. Students communicate and collaborate quickly online. While research used to be the domain of the library, Google has become our primary search engine. Social networks, crowdsourcing, and issues regarding online identity and privacy fall in this category. Students can use sites like Facebook and Instagram to share and retrieve information and multimedia quickly. Finally, visualization technologies are a growing set of tools that allow for large sets of information to be analyzed and displayed. They enable easier data driven decisions by making the complex simple. Large sets of information can be visualized in real time. New areas of virtualization and augmented or mixed realities fit into this broad category. Another example is 3D printing. With the categories in mind, I want to briefly identify the important developments in educational technology for higher education as identifies in the Horizon Report. A key criterion for inclusion in the report was its potential relevance to teaching, learning, and creative inquiry in higher education. Analytics Technologies: Data and big data are being used more frequently to support higher education…and there is a continued focus on measuring learning. Using “grades” as an analytics tool for students to measure their success is nothing new. Instructors, students, administrators and teachers are relying on more high tech analytics to provide insights to complete their tasks. For examples, analytics technologies can help identify at-risk students and trigger interventions. Analytics can be used by students to guide and improve their own learning and by teachers to improve outcomes and tailor content in the classroom. Post education career options can be enhanced by connecting into resources liked LinkedIn that offer data-driven, analytics to help customize pathways to employment. Makerspaces work by bringing together experts and novices from a variety of disciplines to design, build, invent, and rethink various products. Makerspaces connect higher education and industry. These spaces often include computers, power tools, 3D printers, and other technologies. A perceived benefit of makerspaces is that it engages learners to develop hands-on learning. Adaptive Learning: Last week we explored a pilot project on Adaptive Learning here at the University of Wisconsin Whitewater. Adaptive learning is one technique for providing personalized learning, which aims to provide efficient, effective, and customized learning paths to engage each student. Finding the correct applications, developing the pathways, implementing the solutions, will take time. Artificial Intelligence is no longer in the realm of fiction! Amazon uses it to predict products you may be interested in (and they want to sell); google uses it to guess what you will type next and search for; advertising uses it to find ways to connect individual products to users. Self-driving cars appear imminent. In education, Artificial Intelligence is becoming increasingly utilized for implementing today’s leading pedagogical trends, such as personalized learning. Analytics technologies allow us to do descriptive and diagnostic work; artificial intelligence will allow us to do more predictive and prescriptive work. Mixed Reality is an emerging environment where digital and physical objects co-exist. The augmented reality game Pokémon Go is an example of this intersection. In education, virtual reality simulations have be used to train and asses medical students; first responders have trained in mixed reality environment overlaying hot-spots and other hazards. In the social sciences mixed reality tools have allowed for the virtual recreation of historical landmarks and allowed students to interact with virtual residents. Robotics: The Harvard Business Review notes… “We expect the global industrial robot population to double to about four million by 2020, changing the competitive landscape in dozens of fields — from underground mining to consumer goods and aerospace manufacturing.” They go on to provide an example: “Foxconn, which employs more than a million workers in mainland China, plans to automate 70% of its assembly work within the next three years.” Higher education faces a significant challenge: preparing students for success in the next generation workforce and addressing corresponding emergent societal challenges. I hope this exploration of the 2018 Higher Education Horizon Report has provided a window into the future. The report is provides a lot of ideas to fuel our themes of Technology, Education and Design. Next week offers a change of pace as I will provide updates from the 2018 Quality Matters Connect conference from St. Louis! Citation: Samantha Adams Becker, Malcolm Brown, Eden Dahlstrom, Annie Davis, Kristi DePaul, Veronica Diaz, and Jeffrey Pomerantz. NMC Horizon Report: 2018 Higher Education Edition. Louisville, CO: EDUCAUSE, 2018. This week, I want to explore Adaptive Learning and examine a pilot project running at UW Whitewater. Over the summer of 2018, Matt Vick piloted adaptive learning in his own course using the platform “Realizeit.” He is now working with other instructors to use the platform in their courses. 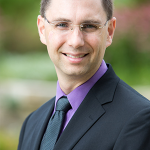 Matt is currently the Interim Associate Dean of the UW-Whitewater School of Graduate Studies and Continuing Education. Adaptive Learning is an education method that creates a personalized, individual experience for a learner. Adaptive platforms likes Realizeit provide real-time feedback and data to assess student knowledge and progress toward mastery. 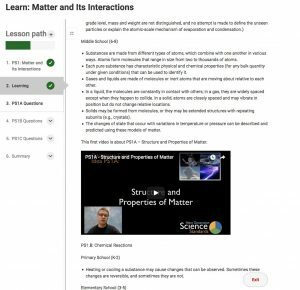 Learners get customized content specifically tailored to their learning. If they can demonstrate that they already know a concept, they do not need to repeat it. It “adapts” to account for prior knowledge. Not every student is going to see every piece of content; they see just what they need to learn and do not already know. Instructors get insights into their students’ progress through the class. An instructor would spend less time working on the content delivery or knowledge transfer but instead focus their interactions on higher-level applied thinking. That is similar to what Matt experienced in his “Teaching Science in Elementary and Middle School” course this summer. After creating the map of the nodes, Matt created text and provided video links for learning objects in various nodes the corresponded to knowledge areas students needed to know. The Realizeit system determines knowledge for these areas – students that already knew the content would not need to work through those areas. They were able to review questions and information in places they may not be that strong. 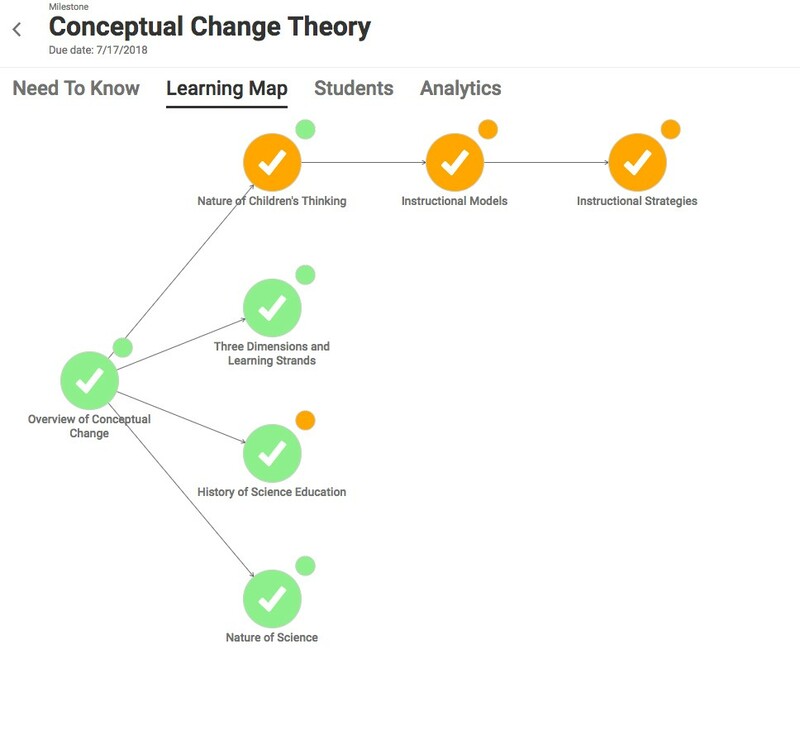 An example of a learning map is shown. What are some the challenges to adaptive learning? One of the challenges was building the banks of questions to differentiate levels of learning and determine what students knew. This was a large amount of work. Matt created additional content and assessment questions. The team hired a student worker to review the questions for formatting and display and to help troubleshoot and test the system. Students can repeat nodes to work towards mastery. Writing these questions requires more content. New models are needed to differentiate learning…if there are multiple paths you need multiple layers of assessment to determine knowledge. It is important to note that adaptive learning does not replace reading, or homework, or other more traditional activities in the classroom. Each node requires content! While Realize it determines an individual student’s knowledge of a particular topic, the platforms delivers lesson plans and content. Not every student will know the same things about a topic. 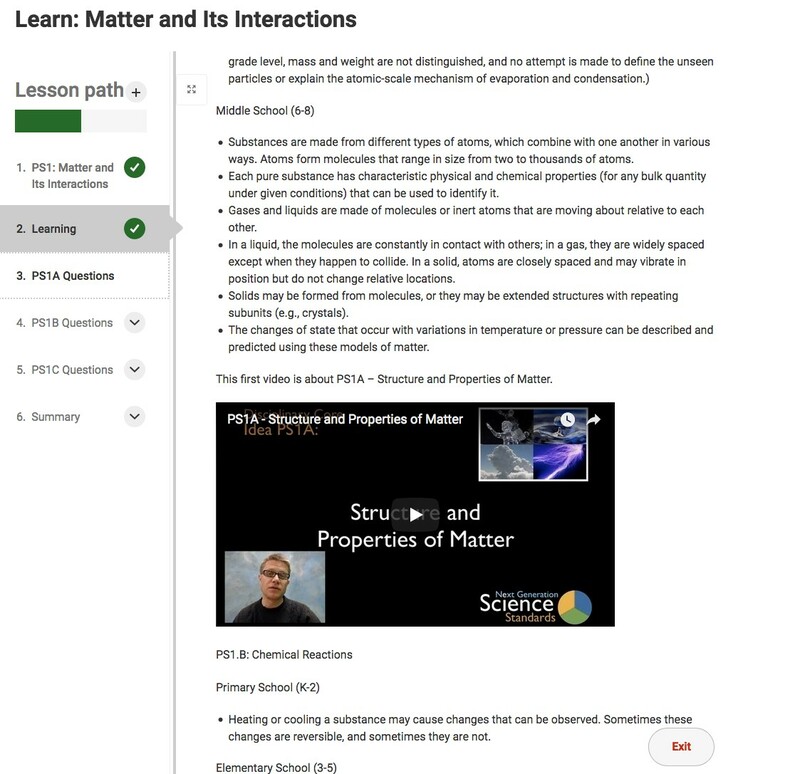 For the structure of Matt’s “Teaching Science in Elementary and Middle School” course, there were additional activities outside of the adaptive platform. An example of a Lesson Path follows. What were some of the lessons learned? While Matt spent a greater amount of time to set up the course, once it was in place, he was able to provide more attention to specific student needs in the class. He reported that he spent about 10% of his time teaching the course doing lower level remediation which was down from about 30% of a normal section. It took a LOT of time to set up, map, and configure and configure the course. An adaptive platform requires that content be restructured and rebuilt. Because each student will know different things from a knowledge set more content is needed. Students adapted to the system much more easily than anticipated. It was intuitive and easy to use from the student’s point of view. The determine knowledge algorithms worked! This provided a great way to validate prior learning and provide individual learning experiences. Adaptive learning could benefit others by rethinking course content into smaller chunks. Low stakes, granular assessments help adult learners or accelerated learners move through a course at different paces. 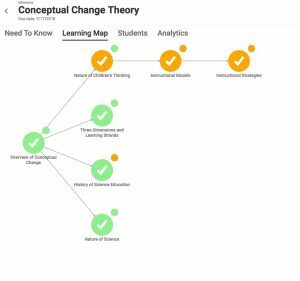 These adaptive learning structures help validate non-credit learning processes and honor the time and information students already know. A system like Realizeit could benefit courses that contain a large body of knowledge…especially for content that instructors think students should really know. Adaptive learning has a lot of potential. Creating personalized learning paths in an automated and individual way could benefit students. Adaptive platforms could deliver large bodies of knowledge more efficiently than traditional methods.